‘In looking over my sister Anne’s papers, I find mournful evidence that religious feeling had been to her but too much like what it was to Cowper’, these were the words of Charlotte Brontë after the death of her youngest sister Anne, but just who was Cowper and what influence did he have on the life and writing of Anne Brontë? William Cowper was born in Berkhamsted, Hertfordshire, in 1731 and died in 1800, and yet his reputation was still huge at the time that the Brontë were writing. Cowper’s fame is rather faded now, but he was one of the most popular poets of his time, and seen as one of the most important influences on the Romantic movement epitomised by the likes of Wordsworth, Keats and Byron. His poetry as a whole has two main themes running through it – the power of nature and the power of faith, and one of his lasting legacies is the phrase: ‘God moves in mysterious ways’ which is taken (slightly altered) from his poem ‘Light Shining Out Of Darkness’. 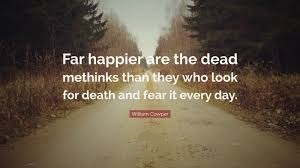 Cowper also put his fame to good use, becoming a prominent anti-slavery campaigner in the late eighteenth century, and his words were used by Martin Luther King Jr. during his civil rights campaigns. We can safely assume that Cowper’s work was read and enjoyed in the Brontë household, and Anne herself left evidence of this that we’ll look at later, but it wasn’t his poetry that Charlotte was referring to in her comment at the head of this post. 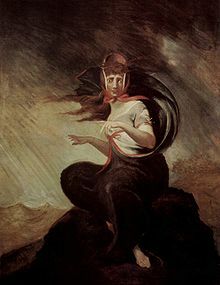 Cowper had two things in common with Anne (and indeed with Charlotte): they both lost their mothers at an early age, and they were both attacked by religious doubts that drove them to their mental and physical limits. From an early age Anne Brontë was a keen biblical scholar, but she found her interpretation of the bible differed greatly from much of the church’s teaching of the day. Calvinism was an increasingly powerful faction within the Church of England. Calvinist preachers, in effect what we would think of as Puritans today, taught that sin once committed could never be expunged, and that you could even be born a sinner and condemned to the fiery torments of hell forever. It’s difficult for us today, even those of us who have faith, to imagine the terror that hell represented in the early and mid nineteenth century. To Anne Brontë and many others, the threat of hell was a real place where people would suffer the worst kind of torments. During her years as a pupil at Roe Head, Anne dwelt more and more on thoughts of eternal damnation – would those she loved be condemned to hell, would she herself end there? These thoughts interrupted Anne’s sleep, turned all happiness into sadness, and eventually led to a physical and mental collapse that resulted in her being sent back to Haworth from Roe Head. Having come through this crisis Anne found a new and stronger faith based upon the notion of a loving and forgiving God, and although it may sound strange to us that was a controversial theory at the time. She continued, however, to be beset by doubts and fears from time to time. 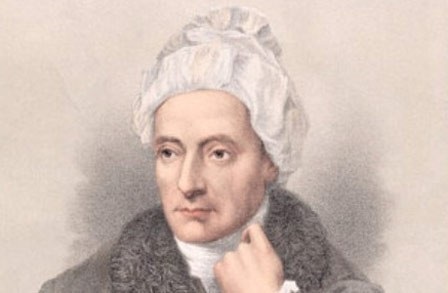 William Cowper was famous not only for his poetry, but also for the religious fears that beset him. He found it harder to overcome them than Anne did, and was committed to an insane asylum between 1763 and 1765. He had another breakdown in 1773, after having a dream in which he foresaw that he was to be punished with eternal damnation. Certainly, Anne thought very highly of William Cowper, not only of his work but of him as a person – he had faced the same struggles, confronted the same demons that she had. It is this that led Anne to write a poem to his memory, and so we finish today’s post with Anne Brontë’s poem ‘To Cowper’. Had filled the Poet’s heart.